Thanks to the grit and resilience and determination of the American people…we've been able to clear away the rubble from the financial crisis. 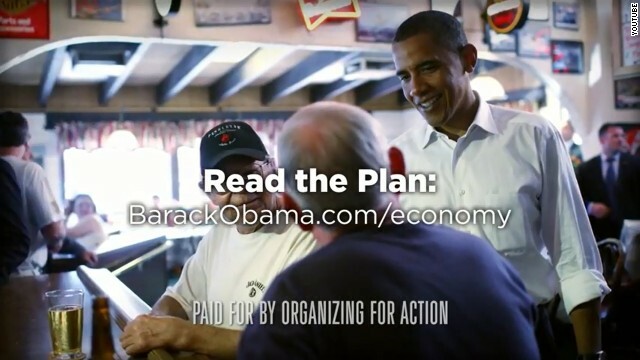 We've started to lay a new foundation for stronger, more durable economic growth," Obama is seen saying in the ad. OFA, a non-profit group, was formed from the president's campaign organization at the conclusion of last year's presidential campaign. Their mission is advancing policy items from Obama's agenda. In the past year they've pushed the president's plans of gun control, immigration and health care. In June the group launched a seven-figure ad buy meant to promote the benefits of Obamacare, the sweeping health care law that is beginning to go into effect. Obama's economic speech at Knox College on Wednesday was followed by similar addresses in Missouri and Florida. He's expected to make similar trips during the next month to advance his proposals on jobs and the economy, issues that rate highest among Americans in polls. Those addresses will launch a month-long attempt to counter congressional Republicans, who are expected to use the upcoming August recess to blast the president's proposals in their home districts and states. Wary of allowing the momentum to shift in favor of the GOP, members of OFA has organized their own push called Action August that will bolster the president's message in individual states. When Obama spoke to OFA members earlier this week, he said Washington had become distracted from economic issues. "It's going to be the kickoff to what is essentially several months of us trying to get Washington and the press to refocus on the economy and the struggles that middle-class families are going through, but also for us to start exploring some big and bold ideas," he said. Republicans, however, have characterized the return to the economy as yet another attempt by the president to focus on jobs without offering any new ideas. Is the speech going to be on Comedy Central, I hope so.